Do you know the saying where chefs only eat frozen and ready-made meals because they don’t want to cook after coming home from work? I’m willing to bet most of that hesitation comes from the fact that chopping food can be very tedious work. Cooking is a fun, noble activity, but not every part of it is equally interesting, especially when onions come into play. No matter how much experience you have in the field, chopping onions is often extremely unpleasant. 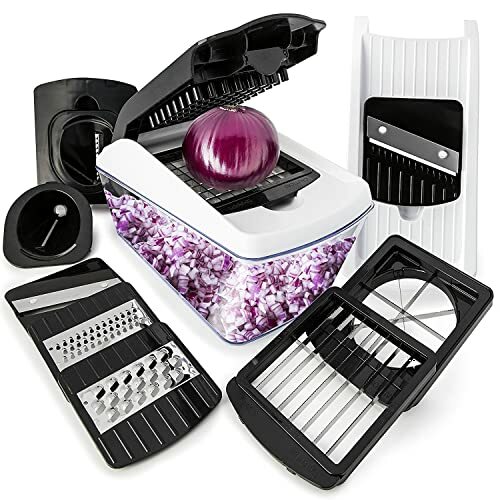 Thankfully, we now have handy little chopping tools that make the process less painful and save a good chunk of time you could be spending with your guests or family. I must confess, I was skeptical when I was first considering getting a vegetable chopper for myself. I’ve heard countless stories from friends and neighbors where their fancy chopping tools lost their edge and were really inconvenient to sharpen. Some of them straight-up broke after a period of usage! I wasn’t sure what compelled them to invest that money if the end result was only a short period of convenience. As it turns out, most of those friends and neighbors did very little research on the subject and ended up settling on low-end, mediocre products. Once I went exploring for myself, I found plenty of good-quality choppers I could recommend to them. Sadly, a few of them are now forever against the idea of getting another one. Let’s examine what goes into a good vegetable chopper, so you don’t end up making the same mistake, shall we? 4. 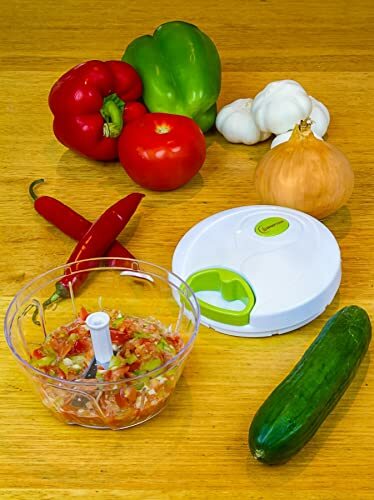 Vremi Food Chopper – The "Supermodel"
Not every chopper is powered by electricity. Some of them use good old-fashioned elbow grease, which saves power but brings the obvious disadvantages of less time saved and more energy expended. Hand-powered choppers are also less expensive, so if you don’t mind putting in a smidgeon of extra work, that could be a good investment. Electric choppers often resemble blenders and can be used for more than just simple chopping. However, you usually can’t bring electric choppers to a picnic, so if you like to make trips with your family, that’s a bit of a downside. Well, it’s not as simple. The more chopped food a chopper can hold, the more it tends to cost. Not only that, but you also need to consider the space in your dishwasher, if parts of your chopper are dishwasher-safe. I don’t think you should go too crazy for big choppers, as I can’t remember the last time I chopped enough food for the capacity to be a deal-breaker. Quick Tip: If your chopper is of the blender-ish variety, don’t fill it all the way. If you leave some space, the chopped pieces can move around more efficiently, which speeds up the entire cutting process. From what I’ve seen, you want two things when it comes to materials. The blades need to be sharp and durable so you don’t have to replace them or constantly sharpen them or worry about rust. 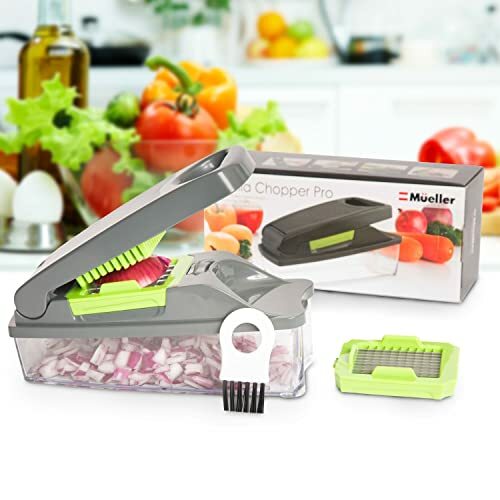 But even with super solid blades, you run into a frustrating issue if the rest of your chopper is fragile or poorly made: shoddy plastic parts can break off or deform, making your chopping either more difficult or nearly impossible, which defeats the entire purpose of the device. Might as well use a knife at that point! Not every chopper comes with the same add-ons, and the hand-powered ones often offer a variety of ways to slice your food. Will you have a favorite size for your chopped bits? Sure, and you will likely use only one or two of those boards on a daily basis. But that doesn’t mean the extras aren’t useful! I like to switch up how my vegetables are sliced for ﻿salads, since it’s fun for the children and it helps the salad feel new and innovative each time. This is why I appreciate extra settings or boards, measurements on the outside of the chopper bowl, and all these other fun features. They bring extra convenience, and convenience is the whole reason for owning one of these choppers! After finding all of this out, I had to narrow down my choices. Having a convenient way to make salads (and smoothies, if you find a good blender) is amazing during the summer, especially when you’re planning on having visitors like I am. Remember the important thing: your preferences are more important than anything! I once bought a coffee machine that didn’t entirely fit my needs solely because I was hunting for good financial deals. Every time I used the coffee machine, I would feel a bit of regret for not picking up a different one that I was told is worse. Your instincts are an important part of any purchasing decision. With all this said, I’ve put together a small list of good choppers that any smart home cook should consider, so let’s get into it! I ran into this little thing in a nearby store, and I was tempted to just buy it and end my hunt right there. The biggest selling point here is that this chopper is meant to save you from onion vapors. That is such a huge thing for me, as it’s very hard to teach family members how to make delicious meals when you’re both stuck standing there, crying your eyes out. The construction is simple and feels durable, which is good for those times when you have to put more pressure on the chopper to get through some tougher veggies. The discs that do the actual work are of German quality and are so sharp; I had to buy a fresh pack of bandages after accidentally scoring a few cuts on my fingertips while taking them out for cleaning. The chopper comes with a cleaning brush and an e-book of recipes, so you have everything you need to start using it. There’s only one issue I’ve noticed. When you’re trying to cut cheese and other similarly sticky foods, the chopper doesn’t perform as well. Bits of food get stuck in a way that requires you to dislodge them manually, and the pushing mechanism becomes looser. A bit of a hassle, but not a really serious issue, especially after seeing how fast this chopper does its thing! This chopper is closer to a regular blender in how it operates. This makes it much better for chopping up nuts, as they can require crazy amounts of pressure when you’re using a pressure-based model. Shredding a bunch of hazelnuts produces a very helpful sweet spice for cakes and ice cream, especially when you combine it with some delicious homemade caramel spread. 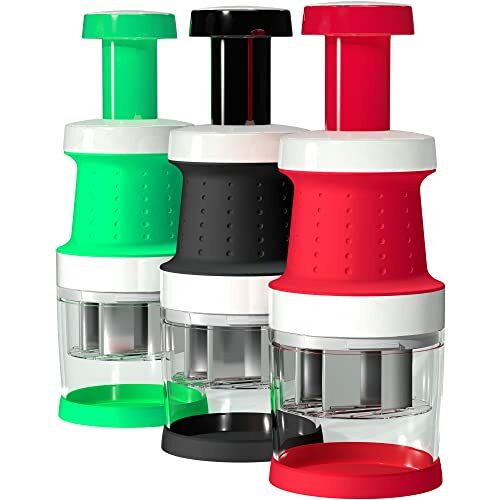 The chopper comes in a variety of sizes (the smallest being around 3 cups), and this affects the price, so you can pick the least harmful investment easily. 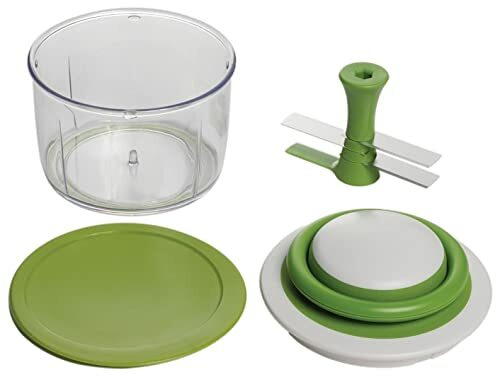 The blades and bowl are easy to clean, and can be safely put in the dishwasher, so you don’t encounter that moment of hesitation where you’re trying to weigh whether your dish is worth the cleanup job afterward. The chopper comes bundled with a manual and numerous e-books full of recipes, so you can instantly plan a fresh new meal for your loved ones. I only found one downside, but it’s a point of annoyance. Pieces of food near the top don’t get chopped as efficiently as the ones that are lower in the bowl, and it can be quite a problem if you’re making larger portions. Just make sure to stir regularly and you’ll be in the clear. At first, I wasn’t sure what made this chopper stand out. It looked pretty generic until I tried it with meat and tomatoes. After that, it was all clear to me. The main advantage to using this chopper is how clean the cuts are. The blades are strong enough to chop meat (including some tougher pieces) while being delicate enough not to turn tomatoes into paste. Normally when you put a tomato into a chopper, the result is somewhere between “mush” and “smoothie”. Not here. Additionally, all the parts are dishwasher-safe (as long as you put them on the top rack), so you have no extra work after using the chopper. It’s completely hand-powered, so you can take it on a trip to make some funky outdoors snacks. Using it is pretty easy, too – just twist the lid on and pull the cord. The lid is incredibly secure once you start chopping, and it’s also tied to the main downside. The downside is that the lid can be too secure at times. By that I mean, you may have problems unscrewing it when you want to take the food out. If you have arthritis or similar issues, you might want to skip this chopper. Otherwise, it’s affordable enough to help you avoid a lot of risk while picking your purchase. What a piece of eye candy! This 4-part chopper is very simple to use. You just put the food into the bottom bowl, push down the lever and watch it go. You can keep the top half on while you transfer the food to another bowl or plate, to reduce the risk of spilling. The chopping process is done in a heartbeat, I was amazed! Cleaning is also a smooth procedure, even if the parts take a while to dry﻿﻿ ou﻿﻿t. Being easy to disassemble also makes the chopper easy to store. I managed to fit it into a cupboard that’s too small for most other appliances, so now that space isn’t just a home for the odd fly. I love how the lever sort of massages my hand while I’m holding it down, it makes me think that I should use this chopper when I get a cramp. The main downside is that the Vremi chopper just isn’t very durable. It’s light and everything, but I don’t see it outlasting some other models I’ve mentioned. That’s not to say it will break after a month, there’s no need to worry. This one caught my eye as soon as I walked into the store where it was being sold. There are so many blades to choose from; I love the variety. And all of it can be easily disassembled for a quick drip to the dishwasher’s top rack. The bowl can store up to one quart, which is basically enough for a whole salad if you want to go that route. The blades resist corrosion and I have yet to see a drop in sharpness or overall performance. It’s just such a versatile tool, and the sharpness of the blades makes it so that it’s not tiring to use, especially compared to something like a cheese grater. Just slice bigger veggies in two before processing them, and you’ll be good to go. The bowl is sturdy and feels durable, and I haven’t seen a scratch on any part of the chopper so far. The only issue I’ve had with it so far is that it’s not the most delicate chopper. Tomatoes can be a challenge, as you want to avoid mashing them into a paste (unless the recipe calls for it), and the blades can kind of manhandle them. Tougher veggies get chopped up with no problems, so try to remind yourself to be more careful when tomatoes enter the equation. The chopper I ended up sticking with was Fullstar’s Vegetable Chopper – I love so many things about it. I like how it feels like I bought a mini-collection of tools (as I’m a bit of a hoarder when it comes to kitchen gear), I love the versatility and how much it can store. I’ve recommended it to some of my friends, and I’m hoping to hear back from them soon enough. Even the most jaded cook can appreciate real quality, so they shouldn’t put up much of a fight!